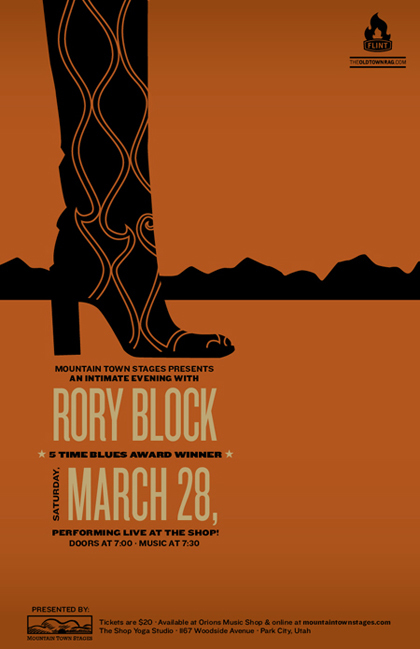 We recently teamed up with Park City’s own Mountain Town Stages to design a poster for world-renowned blues guitarist’s, Rory Block upcoming performance at The Shop. Five-time winner of the prestigious W.C. Handy award, (The Blues Music Awards) Rory has committed her life to playing and and passing on traditional blues music to future generations. Don’t miss Rory’s intimate performance this Saturday at The Shop Yoga Studio, located next to the Park City Library on Woodside Avenue. Tickets are available now online at Mountain Town Stages as well as at Orion’s Music Shop in Park City. The Old Town Rag is now on twitter… wanna follow? Subscribe via RSS. Grain Edit, one of the best blogs going right now, has a fantastic interview with the very clever illustrator/designer, Frank Chimero. Chimero has a knack for putting common thoughts into words and pictures. Spin Cycle is a little feature I am introducing where I revisit some favorite albums of mine that need some dusting off. 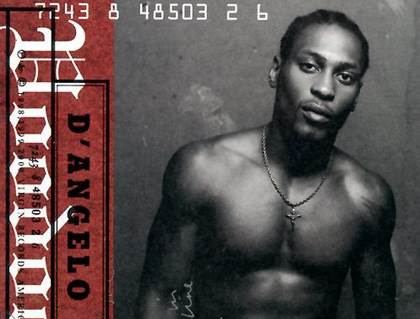 This time around, we’re rediscovering D’Angelo’s Voodoo. I first fell in love with this album as a freshman in high school when it was first released, however I pulled it out of the collection the other day only to really discover the impact it has made on me, and my musical tendencies over the years. As a pioneer of the “neo-soul” movement, D’Angelo brought classic soul sensibilities to the hip-hop era with his first release Brown Sugar. Five years later he followed Sugar, with the exquisitely refined Voodoo. Voodoo is a fusion of soul, jazz, hip-hop and funk and had a much looser, jam oriented atmosphere than Brown Sugar. A perfect example comes on the second track, Devil’s Pie, which features a killer bass line by Charlie Hunter, who also plays guitar on the album. While much of the album was produced by Questlove at Electric Lady Studios, Voodoo really needs to be heard through headphones to fully do it justice. Towards the end of the album appears the most successful track on the album, Untitled – How Does it Feel, which was released as a single. While the highly successful Voodoo has only left us wishing for more from D’Angelo, who has remained fairly absent from the music scene since the subsequent tour, rumors of a third studio release have surfaced for early this year. Nevertheless, Voodoo is a finely-crafted sonic journey well equipped to stand the test of time. Up top is Mel Dogg chillin’ Sunday style. 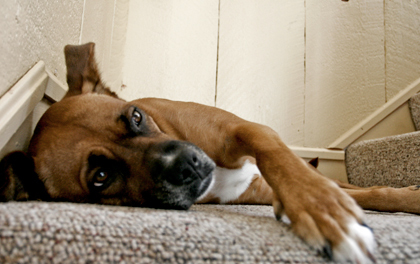 On second thought… this photo is pretty representative of most of her days. Lucky dog. If you’re hip to the poster scene, I am sure you have heard of Jason Munn and The Small Stakes. As an aspiring print maker, it’s both inspiring and somewhat discouraging to see someone pump out such great work so consistently. Perfect example of how far simplicity can take a design. Speaking of talent… illustrator Sarah A. King has some great work. 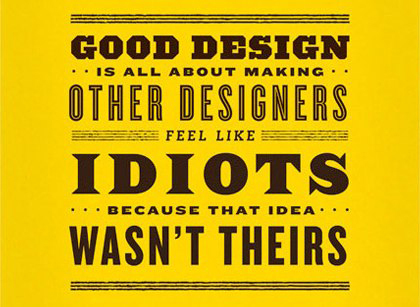 Love the way she incorporates typography, very Sagmeisteresque. Especially like the bicycle. Pulitzer-Prize winning comic artist, Art Spiegelman’s private sketchbook is being featured in an anthology titled Be A Nose!. This animated clip shows some of Spiegelman’s animation, paired up with Black Keys drummer Patrick Carney’s instrumentals. Definitely worth checking out via Pitchfork. If you haven’t made it to a movie at the Film Series, I’d highly suggest checking out the March calendar. Just about every movie showing this month was nominated for an award, so it would be a perfect time to check out some great films and introduce yourself to one of Park City’s best kept secrets. Starting this Friday and playing through the weekend, is Cadillac Records. I missed this movie when it originally came through the theaters, so I am definitely going to check it out this time around. All films show in the Jim Santy Auditorium located in the Park City Library at 7:00 PM on Friday & Saturday, and 6:00 PM on Sundays. Head over to the Film Series web site for a full listing of films, as well as for film trailers and reviews.